Observant fly-fishers are normally the most successful of their breed, and over time I have endeavored to be as observant as possible since I need all the help I can get when I am attempting to catch fish. 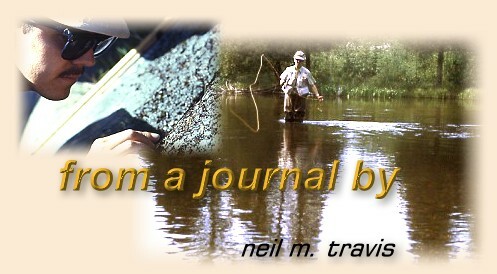 Two incidents in recent weeks have help to reinforce this maxim of fly-fishing success in my memory. Both of these occasions happened on one of our local spring creeks where I have the blessing of unlimited access, and both occurred in the evening hours, which is my favorite time to fish these waters. The first incident occurred around the middle of July, and after a very warm day for Montana I drove out to the creek as the sun began to drop toward the western horizon. Being north of the 45th parallel our summer evenings are very long in mid-summer with twilight extending until nearly 10 P.M. I prefer to arrive on the creek as the shadows begin to lengthen, and the cool air from the nearby mountains begins to fall into the valley. At this time all of nature comes alive after a long hot day, and I revel in the wildlife and the subtle shades of color that tint the clouds and surrounding mountain peaks. Even if I fail to connect with any trout I find much pleasure in the beauty of God's creation on a Montana summer evening. A soft breeze was blowing out of the south when I arrived, and except for a few caddis bouncing around along the edge of the stream there was no apparent insect activity. An occasional tiddler (small fish) was splatting at the bouncing caddis, but otherwise the surface of the creek was an unbroken mirror reflecting the cloudless big sky stretching overhead. Parking my vehicle near one of my favorite stretches I strolled leisurely along the banks enjoying the cool evening breezes and the sounds of nature that surrounded me. I scanned the surrounding meadows looking for mayfly spinners dancing in the setting sun, but there were none to be seen. I had not even bothered to put on my waders or assemble my other gear since it appeared that nothing would be happening this night. I sat down on a wooden bench along the stream mesmerized by the delicate shifting currents as they pulsed over the weed beds. How long I sat there I am not quite certain, but suddenly my reverie was broken by the faint twittering of birds somewhere over my head. Looking up I saw a large flock of swallows swooping and gliding about a 100 feet above the stream in an obvious feeding frenzy. Quickly I was on my feet and headed back to my vehicle for my gear. Returning to the stream in record time I was greeted by the gratifying sight of circular rings and trout noses breaking the surface. Wading into the stream a quick check with my aquarium net produced several small mayfly spinners. Choosing what I believed to be a satisfactory imitation I proceeded to cast to the closest nose, and was gratified with a quick connection with what would prove to be the first of several very nice brown trout. Just the other evening I was once again on the creek. A strong east wind was blowing, and the dark faced clouds reminded me that winter was hiding just over the northern mountains. I sat hunched against the wind watching a small family of mallard ducks working slowly upstream. Unaware of my presence they swam along, stopping here and there to tip up and feed on the bottom. When they arrived opposite from where I was sitting I noticed that there was a disturbance in the water several yards below the feeding ducks. Concentrating my attention on the water I could see the flash of feeding trout. There were no insects hatching that I could observe, but there were several trout feeding just below the ducks. Suddenly it dawned upon me that the trout were feeding on the nymphs that the ducks were dislodging as they fed on the Elodea and Fountain Grass on the stream bottom. The ducks were performing the San Juan shuffle, and the trout were taking advantage of the bounty.